This would make a very snazzy poster though! Hey Peter, Was there any history ever given to the foot Elite? 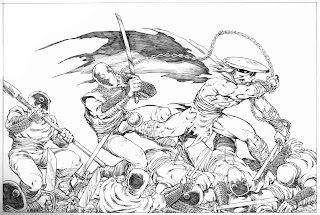 Where they shredder clones in the comics, for instance? In the new show, they almost don't seem human at all given their teleportation abilities and red eyes..."
Neil, the only backstory I recall Kevin and I creating for the Elite was that they were the cream of the crop of the Foot ninja, specially selected and trained by the Shredder to be his personal guard. As much as the term "cyberinking" makes me cringe, I love seeing these crisp, tight pencils. -->> ..sorry, since almost day one ( ok a little after day one ) ..
elite have just been plain effin' cool. Representing Shear Power ( least to me ) . and that sickle n' chain from the rampaging Elite from C .A .W> ..just jesus wow !! And again ..it's that powerful supporting cast that's helped make the TMNTs great. Whatever is next as far as the movie goes, it'd be cool to see these guys hit the silver screen. Ahh, OK. there where one or two instances where I thought it would be impossible for them to just do a ninja flash technique and appear and disappear instantly. Hence why I thought it might be teleportation. I'd love to see a live action Foot Elite. So long as all their Martial Art techniques are as CGI free as possible.
" GREAT OOGLY MOOGLY "
there's an ol' Frank Zappa song about a fur trapper that quotes that same line. Recently in Tales.. that old TMNT gag came up ( an old wizard was named "The Great Oogly Moogly" ) , and then i heard the Zappa song later the same day. I'm gonna assume this is more than a coincidence.